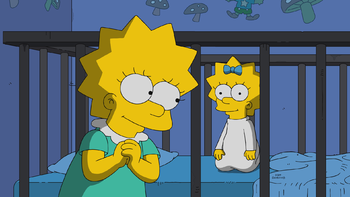 This week on the Simpsons, we get a Maggie-centric episode, plus Fat Tony returns. It should be a good one tonight! Marge can't sleep, and she asks Homer to watch Maggie while she has friends over, which Homer agrees to. Homer is trying to play peek-a-boo with her, but Maggie isn't pleased. Marge tells the ladies that they've been asked to do some decorating, and they respond by insulting her sense of style and her husband. Upstairs, Homer hears a whistling noise and is confused. He eventually realizes that it's Maggie, and he has a fantasy about using her to pretend he can whistle. Meanwhile, Marge is downstairs thinking about what her friends said and she decides that she'll prove that she has style by decorating the late pick-up room for the school. She does a really good job and created a beautiful room that even impresses Fat Tony. Tony wants her to be his interior decorator. At the bar, Homer is showing off "his" whistling skills when Abe walks in. Maggie jumps out from Homer's bag, revealing everything. Abe then starts talking about his own whistling skills, and how he hopes Maggie's skills will be put to good use. Fat Tony shows Marge the Post Office that she will be renovating, and one of his men shoots at her paint samples by accident. Abe and Homer take Maggie to a child talent competition, and they have her show off her skills. Marge goes to the hardware store to pick out some items for the interior of the post office. At home that night, Lisa hears Maggie's whistling and starts to worry about Maggie being more gifted. Homer sees a documentary show about a former child star whose life became a downward spiral after a disastrous Half Time performance, and he starts to wonder if he entered Maggie in the talent show for the right reasons. Marge has designed the post office, which has a lot of bedrooms and is very clearly been made for prostitution. At home, everyone is acting weird. Nobody wants to tell anyone else about what they've been doing lately. At the talent show, Homer decides that show business isn't a business he want Maggie to have anything to do with. However, Maggie won't leave. She's turned into a diva. Marge is finally realizing what she's been working on, and her friends come in to be all holier-than-thou. Marge is upset with Fat Tony, and she calls him a liar. He asks her to leave, and she tells him the this mom had a PO Box at the office. They open his mom's box, where they find a letter from the Pope. It's then that Tony decides to shut the brothel down. Back at the talent show, Maggie humiliated herself with an awful performance. When the audience boos her, Homer comes out to talk about how great she is. This was a great episode, and I really enjoyed both storylines. Joe Mantegna's Fat Tony is always a welcome face, so it was great to have him back this week. Marge's storyline was really funny, and I thought it was better than her storyline last week. Homer and Maggie's storyline was ver good too, and I loved the really sweet ending to it. I also liked that this episode had two different stories, something that I missed last week. All in all, it was an improvement on last week's in every way. What did you think of this episode? Let me know in the comments below! Next week's the Treehouse of Horror, so that means it's officially the Halloween season! After all, it isn't Halloween without a Treehouse of Horror!